Gradually, the upcoming Sony Animated animated Spider-Man movie Into The Spider-Verse has grown from a curiosity to quite possibly the most anticipated animated feature of the year. Since the first teaser hit and introduced the unique visual style this film has generated a lot of buzz, both in the animation community and beyond. The first full trailer went one better, putting the meeting of (an older) original Spidey Peter Parker and Spider-Verse lead Miles Morales at its heart. It even finished up by teasing Spider-Gwen and really hinting at the larger cast. The newest trailer shows us that we really hadn't seen anything yet. We know you can't wait any longer so here's the trailer, below! Keep reading for a more detailed breakdown and some largely baseless but possibly fun speculation. After a quick recap of his adventures he says "But This isn't about me, Not any more". Enter Miles Morales, the film's lead. As seen in the previous trailer, we have a cute scene between Miles and his cop Dad, plus some scenes of him as Spider-Man swinging around New York. "I'm the One and Only Spider-Man.. at least that's what I thought!" It seems that the cause of the cross-dimensional happenings at the centre of the film is the villainous Kingpin (voiced here by Liev Schreiber). "Ever hear of a super-collider?" he asks someone (perhaps Miles himself). Whatever he's up to somehow leads to some kind of visually spectacular explosion. Said spectacular explosion seems to open a gateway between dimensions, which sends Miles through to meet Parker. Which results in the meeting between the two of them in a diner, that we have seen in previously released trailers and images. Parker apparently tries to explain the ins-and-outs of multi-dimensional theory with the aid of French Fries (as you do). This seems to be the start of a mentor relationship between the two Spider-Men, with the more experienced passing on his knowledge to the younger. This is where we see an extended version of the previously seen scene where the two are training in an Autumnal forest. Extra points for Mile's costume which looks like a kid's supermarket Halloween costume- and for the onscreen comic-book sound effects! This is also where we met Gwen Stacey (aka Spider Gwen) for the first time at the end of the last trailer. We get a much better look at her this time- including our first look at her unmasked. "I'm from another another dimension" she explains. The Spider-folk come together to try and figure out a way to get back to their universes and save them from destruction. The trailer rounds out with a montage that seems to neatly sum up this movie's appeal. Not only do we get lots of stunning visuals, fantastic action shots and appearances from Spider-Man villains that fans will be sure to recognise, but there are also some lovely moments between Miles and his family. This film only looks better with everything we see! 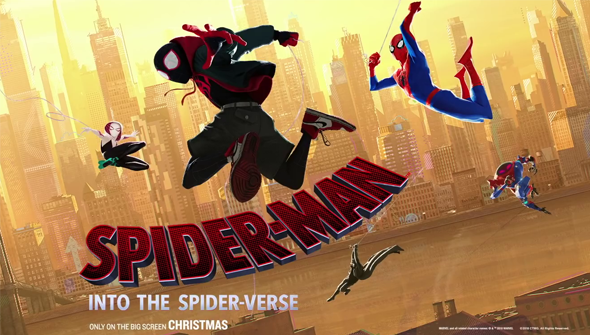 Spider-Man: Into The Spider-Verse is directed by Bob Persichetti, Peter Ramsey, and Rodney Rothman, and the screenplay is by Phil Lord. The film will hit cinemas on December 14, 2018. This is our first detailed trailer breakdown- if you want to see more like it in future, let us know!